Wow what a couple of crazy days. I was lurking over at the gm-volt.com forums Friday night and came across a post about an available Volt being sold with no dealer markup. I sent an email Friday night inquiring about the car and left work to sleep on it. Woke up Saturday morning and checked the email. The salesman confirmed the information via email so I called over to make sure that the car was still available, talk to the dealership and feel things out. The internet sales manager was friendly enough and we talked a little about the car, financing and lease options. I felt comfortable moving forward and began my prequal over the phone and had them hold the car for me till I could get down there later that day. Seeing as I had put my search on hold I wasn’t exactly ready to go through the car buying process. I spent the better part of the morning rushing around gathering all the info I needed and then we headed off to make the 40 mile trip to the dealer. On the way we stopped at the closest Carmax to check on the sell value of my Mustang. They offered a fair price and I left with quote in hand. We arrived at the dealer in the afternoon. The car was as advertised, Cyber Grey, no addons or options. It was sitting back in the service area so we took it out for a quick spin and with that we began the always fun negotiation. I couldn’t get them to work with the advertised Ally finance rates. They said that they were not participating in the special options that included the $7,500 / 0%. I asked about the special Volt lease and they were participating in the U.S. Bank lease but were not getting the numbers into the advertised lease rate. 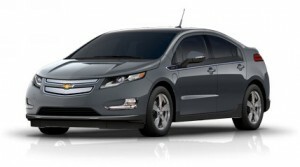 In the end I was happy enough with the package that we put together and walked out the door the new owner of a Volt. The drive home was good. the car seems very solid at freeway speeds. Driving the car feels like a game. We had about 28 miles of range on the battery when we left the dealer. I found myself willing the battery indicator to stay charged. Somewhere around the 30 mile mark the gas engine kicked in. At least at freeway speeds if I hadn’t been watching the gauges like a hawk I might have not even noticed. Volt, you and I are going to have a lot to talk about. Mustang it looks like you will be with me for a little while longer.